“I know mathematics well but I also want to learn to draw,” it said in an oddly human tone. Not all is what it seems on Russian TV. 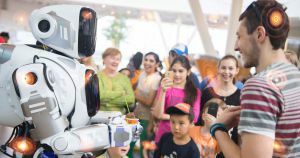 Government-owned TV station Russia-24 showed off a humanoid robot called “Robot Boris” on stage at a youth forum about the future of robotics. “I know mathematics well but I also want to learn to draw,” it yelled out to the crowd in an oddly human tone, as quoted by The Guardian. The robot could also be seen dancing alongside two hired dancers. Its movements seemed suspiciously fluid and life-like. And why does it have a flesh-colored neck? A Russian blog called TJournal posed some serious questions about the broadcast. Where are the robot’s sensors? Why have we never heard of this robot before? Why is the robot dancing so clumsily? Why does it sound like a human being doing a terrible impression of a robot? And yes, they were right. People caught on to the ruse pretty quickly — including The Guardian. The “hi-tech robot” turned out to be “Alyosha the Robot” — a man in a suit, put together by a company called Show Robots — and yes, that’s the real name of the company. It even turns out that you can buy your own robot suit from them for a cool 250,000 roubles (just shy of $3,800). After the event, organizers denied that they ever tried to pass off the robot as real, The Guardian reports. But the Russia-24 broadcast never made it clear the robot was a costume. The future will probably be filled with impressive robots. But this wasn’t one of them. Even if all attendees and organizers knew the robot was a man in a suit all along, what was he doing at at an event that was meant to inspire the Russian youth? Even a more rudimentary (and real) robot would have been far more suitable.